Inspired by a favorite tree, Lisa Lewis' prints celebrate the organic beauty of annual rings. Lisa Lewis' unique prints are inspired by a tree she used to climb as a child. She inked a cross section of that beloved tree and hand printed its organic image, preserving the concentric rings and textures that held so many happy memories of childhood. 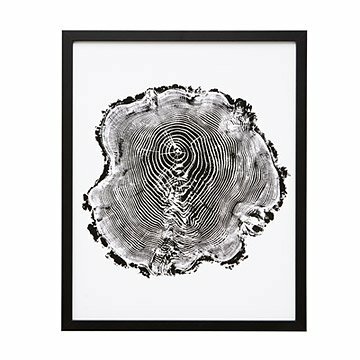 Following the same natural relief technique, this print is made from a salvaged tree with its own unique shape and history. The original relief image is faithfully reproduced in a digital print with optional framing. Made in Utah. For Lisa Lewis, finding simple beauty in her surroundings is second nature. Born and raised in a beautiful river valley in northwest Oregon and now residing in the mountains of central Utah, trees have always been outside her window. She started printing sections of trees when she was given a round from one she climbed as a child. She printed that cross section to preserve the happy and precious memories of her childhood, and her love of tree printing has only deepened since that initial print. She's also drawn by towering urban forms, and dreams to one day own a quiet cabin in the woods and a high-rise apartment in the city.